Two-time first-team All-American, SEC indoor champion … Opened her second campaign as a a Razorback strong, capturing the Arkansas Invitational title with a PR clearance 14-6 … Won the next three-consecutive regular season meets improving her PR two times in the process … Became the sixth-best NCAA vaulter in indoor history with a clearance fo 15-feet, which earned her 10 points and the SEC indoor crown for Arkansas … Qualified for the NCAA Indoor Championships … Placed fifth at the national meet with a best bar of 14-1.50 … Kicked off outdoor season with a fourth-place finish at the Texas Relays off an outdoor PR of 14-9 … Picked up a pair of top-two finishes at the Baylor and John McDonnell Invitationals … Closed out the regular season improving her outdoor PR to 14-11 at the Arkansas Twilight … Earned a silver medal at the SEC Outdoor Championships and went on to qualify for the NCAA Outdoor Championships … Placed fifth at the national meet, clearing 14-5.25 to score three points towards Arkansas’ top-five finish. 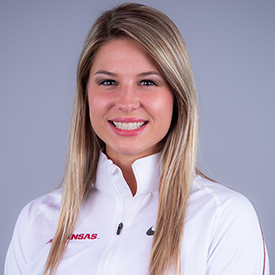 First team indoor All-American, Second team outdoor All-American … Began her first season with Arkansas as the runner-up at the Arkansas Invitational with a clearance of 4.20m/13-9.25 … Picked up her first 14 foot clearance at the Razorback Invitational, up an over 4.33m/14-2.25 to place second … Vaulted a lifetime best 4.40m/14-5.25 to win the Arkansas Qualifier … Earned All-SEC recognition with a third-place finish at the 2016 Southeastern Conference Indoor Championships … One of only three freshmen to qualify for the NCAA Indoor Championships … Finished in sixth place in the pole vault at indoor nationals to earn All-America honors to cap her freshman indoor campaign … Posted her fifth 14 foot clearance of the year to open the outdoor season as the runner-up at the Arkansas Spring Invitational (3/25) … Matched her PR at the John McDonnell Invitational, vaulting 4.40m/14-5.25 for the second time, placing third for her efforts … Earned All-SEC second team as honors as the conference runner-up with a clearance of 4.30m/14-1.25 to help the Razorbacks win their second-consecutive SEC Triple Crown … Qualified for the national meet as the fifth-best performer at the NCAA West Preliminary Round in Kansas … Capped her freshman campaign with a 15th-place finish at the NCAA Outdoor Championship, earning the second All-American recognition of her career. Set the indoor national record in pole vault at the height of 14’4” (2015) … Finished her senior season as the top pole vaulter in the nation on the indoor circuit (2015) … Won the New Balance Outdoor Nationals meet in the pole vault (2015) … Was the second-best long jumper and triple jumper in the state of Arkansas on the indoor circuit (2015) … Won the AR 7A State Meet in the triple jump and 300-meter hurdles (2015) … Finished as the best 300-meter hurdler in Arkansas (2015). Born on Nov. 20, 1996 … Daughter of Brent and Amy Weeks … Has three brothers, Tyler, Matthew and Connor and one sister; Lexi, who also vaults for Arkansas … Majoring in chemistry.